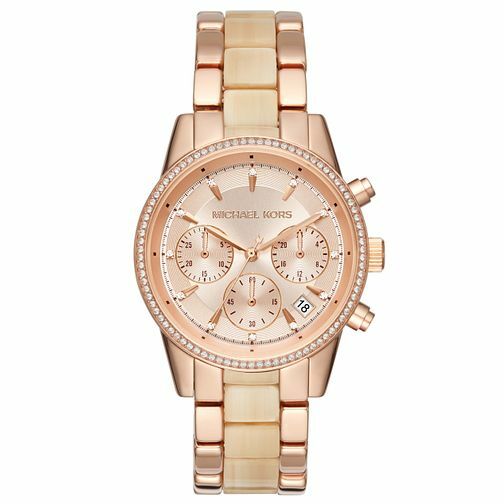 Get rose gold appeal with this sporty and glamorous ladies' rose gold tone stainless steel and rose gold tone bracelet watch from the alluring Michael Kors timepiece collection. Styled with a chronograph stone set dial with date window, alongside a glittering stone set bezel. Michael Kors Ritz Ladies' Rose Gold Tone Bracelet Watch is rated 5.0 out of 5 by 1. Rated 5 out of 5 by Anonymous from Excellent watch! Was a gift for my wife. She simply loved it. It is a classy watch.